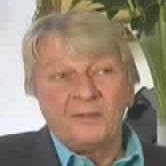 The actor/agent Michael Summerton died on the 16th June 2009, aged 65. Summerton started out in the theatre and then moved to television with a role in the BBC Soap Compact; he then went on to play one of the very first Daleks to appear in Doctor Who. In later life he became an agent, running his own company Michael Summerton Management Ltd which specialises in choreography and dancing, and was notable is being the agent for Arlene Phillips and Bruno Tonioli, both featuring as judges in the popular BBC series Strictly Come Dancing. His agent told him he would not need to learn any lines for the casting, and when he arrived at the BBC workshops he was asked to strip down to his underpants and sit in what appeared to be a tub on castors. Summerton (who was one of the four original Daleks) was instructed in how to move this apparatus about, the director saying: "We want to test this prototype for manoeuvrability. We want you to move forwards, backwards, sideways. Quickly, slowly." Presently the director lowered a lid over him with a plunger sticking out of it. Summerton found himself in total darkness. He would later relate: "When the lid went on I knew my career as an actor was over." The British Board of Film Classification has cleared the extras for the forthcoming release of The Dalek War box set, comprising of the Third Doctor stories Frontier in Space and Planet of the Daleks. No official release date has been given for this set, but it is expected to be released on four discs towards the end of the year. The Doctor Who Restoration Team has an article about the preparation of the stories for DVD release. Doctor Who has been awarded its second Guinness World Record, for Most successful sci-fi series. The award is based upon the show's perfomance in ratings, DVD and book sales, and downloading popularity. The award was presented to Russell T. Davies by Guinness editor-in-chief Craig Glenday at the San-Diego ComicCon on Sunday. Glenday said: "It's the longest-running sci-fi show on TV. But that's not quite enough, it's too good a show to have a longest-running record. Based on things like CD sales, downloads, illegal downloads, we've realised that Doctor Who is the most successful sci-fi show on TV full stop." The show's first record entry is for Longest running sci-fi series. The actor Harry Towb has died at the age of 83. Towb had a long and distinguished career in British film and television appearing in many classic programmes during a career lasting nearly sixty years. Towb had two roles in Doctor Who. He first appeared as Osgood alongside Patrick Troughton in the 1969 story The Seeds of Death. He later appeared alongside Jon Pertwee in the 1971 story Terror of the Autons where, in one of the most memorable scenes of the classic series, he was eaten by a plastic chair. The official BBC Doctor Who site has confirmed that actor John Simm will be reprising his role as The Master in the forthcoming Christmas specials. Though no other details have been confirmed the site reports that they will publish an interview with Simm later in the year. The announcement follows a special preview shown at the San Diego Comic Con, during which the character appeared with other known cast members for the episodes (Bernard Cribbens, Catherine Tate). 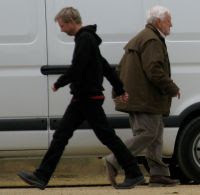 It also confirms reports of the actor seen on location during filming for the episodes back in March/April this year. No name has been given for the episodes so far, though Den of Geek have suggested that it might be called "The End of Time". Update: a new BBC website article reports that as well as John Simm, Alexandra Moen will also be reprising her role as Lucy Saxon, the Master's wife from his previous appearance. The official BBC Doctor Who website has put online, for UK users only, the new trailer for the next special episode starring David Tennant as the Tenth Doctor. The Waters of Mars is due to be broadcast in the UK this autumn, and the new trailer was shown to an enthusiastic audience at the ComicCon convention in the United States yesterday. The UK media website Digital Spy has published a summary of today's Doctor Who discussion panel at the ComicCon event in San Diego, which featured Russell T Davies, David Tennant, Julie Gardner and Euros Lyn discussing their time working on the programme, taking questions from the audience and previewing the forthcoming special episodes. Among the topics raised was the possibility of a Doctor Who feature film, which the panel stated is not a project on which any of them are currently working. The panel also featured a presentation from Guinness World Records, declaring Doctor Who to be "the most successful sci-fi show on TV full stop". The comics news site ComicMix is reporting that an unnamed BBC America executive at ComicCon has confirmed that the BBC has ordered a fourth series of Torchwood. There is as yet no independent confirmation of this; however, a Torchwood panel is scheduled at ComicCon tomorrow, with star John Barrowman, writer/executive producer producer/show creator Russell T Davies, executive producer Julie Gardner and director Euros Lyn. Presumably, if the report from ComicMix is correct, the news will be confirmed at this panel. The science-fiction website io9 has posted a report of the roundtable discussion Russell T Davies, Julie Gardner, Euros Lyn and David Tennant took part in on Saturday at the San Diego ComicCon event in the United States. There to promote the forthcoming specials that will see out Tennant's time as the Tenth Doctor, the group discussed the future of Doctor Who with journalists, and io9's full report contains some casting spoilers for the forthcoming two-part finale to Tennant's time in the TARDIS. Apparently debunked by the group is the idea that a Doctor Who feature film is to be announced at the ComicCon event. The website tvshowsondvd.com has revealed that The War Games and The Black Guardian Trilogy will be released in North America on November 3rd. Issue 411 of Doctor Who Magazine reveals that K9 veteran, John Leeson, will once more voice the robot dog in the upcoming series of adventures produced in Australia. Not only will Leeson voice the original character in the opening episode, he will also voice the redesigned model throughout the 26-episode series. The programme is due for transmission in Australia in the spring of 2010. 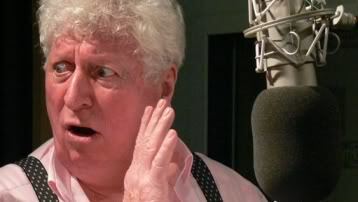 The magazine features more details of the return of Tom Baker to the role of the Doctor, as the veteran actor gives a rare interview explaining his decision to return to the character after nearly thirty years. Baker has recorded a series of five audio plays, under the banner Hornets' Nest, for BBC Audio. He plays the Fourth Doctor, alongside Richard Franklin who returns to the character of Captain Mike Yates, a character he first played in the television series in the early '70s. The first story will be available as a CD or download from 3rd September. DWM is out now across the United Kingdom. Final figures released by BARB put all five episodes of Torchwood – Children of Earth in the top twenty programmes of the week. The figures include those who record the programme and watch it within one week. The highest charting episode was Day Four, which, with 6.76 million watching, was the 11th most watched programme of the week. If figures for the HD showing were included in the BBC1 figures, then Torchwood would have had a top ten place, with episode four beating Emmerdale. All five episodes achieved over 6 million viewers. The series dominated the chart for the BBC HD channel with the five episodes of Torchwood taking the top eight places. Not only did the original five showings take the top five places, but the midnight repeats took places 6, 7 and 8. The BBC Three repeats also fared well with all five episodes appearing in the top ten programmes for the week. All episodes had a final rating over double that of the initial overnight figure. Meanwhile, in the United States, Multichannel News reports that the premiere episode of "Children of Earth" was watched by 1.4 million viewers on Monday, the highest ratings of any programme on BBC America. "We think it'll take the image of Harris Tweed to a new level, when you think that there are millions of people who follow this programme. There's no way the Harris Tweed industry could have bought publicity like this. There's no doubt that young people watch this program. Anything that someone like Doctor Who uses, we hope it will set an example and that young people will go out and buy Harris Tweed clothes." 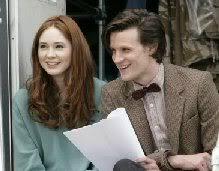 So it was with some delight that today I saw the first picture of the eleventh doctor, played by Matt Smith. The early signs are good - while he's not exactly going to keep John Galliano awake at night, he's very well put together. Preppy, with a neat bow tie, skinny jeans, fitted jacket and no-nonsense black boots, he looks like an Acne catalogue model. And that's a good thing. Dressed as such, he could be hanging around backstage at Pitti Uomo, chatting to some elderly Italian gent who is being snapped by Scott Schuman (AKA the Sartorialist). Smith's hair is still a concern but given my own increasingly leonine locks I probably shouldn't start that argument. Filming in Cardiff, he looks relaxed, happy and (kind of) handsome. I hate this outfit because it commits the ultimate fashion crime: it is trying too hard. It is a patchwork of "Grazia told me this is very fashionable right now" looks, and that is just wrong. A Time Lord should not read Grazia. DM boots and all their lookalike cousins have, incredibly, been having what magazines insist on calling a "comeback" for some time, mainly on the basis that Agyness Deyn likes them. The shortened trousers are the signature style of the perennially trendy menswear designer, Thom Browne. Thanks to the joyless likes of Pharrell Williams, bow ties are very in now but, like, ironically (that sound you hear is the sound of style dying) and, yes, you can buy them at American Apparel. Of course you can. 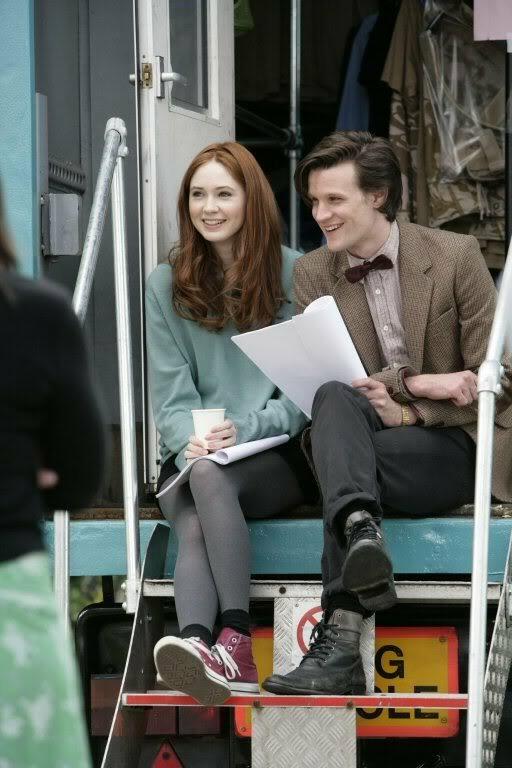 NEW timelord Matt Smith films his first Doctor Who episodes - dressed like a geography teacher. It looked like the latest Doc had travelled back in time to the place fashion forgot. "Whilst David Tennant's Doctor was undoubtedly influenced by Britpop and Quadrophenia, this Doctor seems to be influenced by Indiana Jones' geekier nephew. It seems a curiously British idea to make the lead character in a prime time TV show look purposely and perversely less attractive than they actually are, I can't think of anyone that would look at this image and then decide they would want to stick it on their bedroom wall."